GOLS-Certified Organic Natural Rubber Latex (also available in 100%-Natural Rubber Latex Mattress). 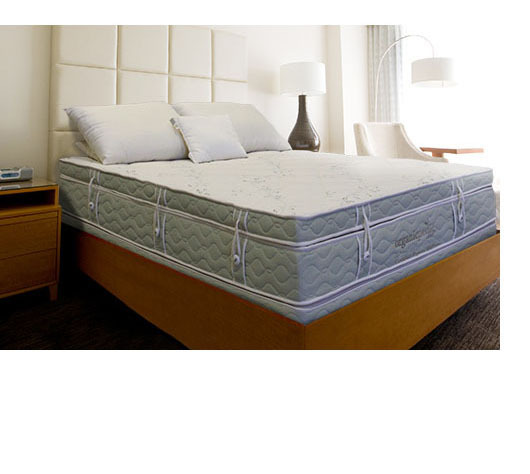 The OrganicPedic® Terra is a four-sided, 12" sculpted-surface pillow-top mattress. It starts with a 3" core of firm, supportive 100%-natural rubber latex. The core is joined with two inches of softer latex on the top and bottom, and covered with our signature OrganicPedic® quilting. A removable, two-sided pillow top (3½" deep)  also made of 100%-natural rubber latex  is then placed on the mattress. The pillow top is made with two surface options: our exclusive sculpted surface on one side, and a flat surface on the other. This provides sleepers with maximum comfort and flexibility. The pillow top is fully covered with our signature OrganicPedic® quilting and attached to the mattress with our exclusive "button-down" process.